Venetia Lanyon, beautiful, intelligent and independent, lives in comfortable seclusion in rural Yorkshire with her precocious brother Aubrey. Her future seems safe and predictable: Either marriage to the respectable but dull Edward Yardley, or a life of peaceful spinsterhood. But when she meets the dashing, dangerous rake Lord Damerel, her well-ordered life is turned upside down, and she embarks upon a relationship with him that scandalizes and horrifies the whole community. Has she found her soul mate, or is she playing with fire? When Sylvester, the Duke of Salford, first meets Phoebe Marlow, he finds her dull and insipid. She finds him insufferably arrogant. But when a series of unforeseen events leads them to be stranded together in a lonely country inn, they are both forced to reassess their hastily formed opinions, and begin a new-found liking and respect for each other. When spirited, independent Miss Annis Wynchwood embroils herself in the affairs of a runaway heiress, she is destined to see a good deal of Mr Carleton, Lucilla's uncivil and high-handed guardian. And, chafing at the restrictions of Bath society, Annis has to admit that at least Mr Oliver Carleton is never boring. It is in regrettable circumstances that beautiful Judith Taverner and her brother Peregrine first meet Julian St John Audley. The man, they both agree, is an insufferably arrogant dandy. But unfortunately for them, he's also the Fifth Earl of Worth, a friend of the Regent and, their legal guardian. The Earl of Spenborough has always been noted for his eccentricity. Leaving a widow younger than his own daughter Serena is one thing, but quite another is leaving Serena's fortune to the trusteeship of the Marquis of Rotherham -- a man whom Serena once jilted and who now has the power to give or withhold his consent to any marriage she might contemplate. When Serena and her lovely young stepmother Fanny decide to move to Bath, Serena makes an odd new friend and discovers an old love, Major Hector Kirkby. When Fate and a chivalrous impulse combine to saddle Viscount Desford with a friendless, homeless waif in the engaging shape of Cherry Steane, who else should he turn to in such a scrape but his childhood playmate, Henrietta Silverdale? And although they refused to oblige their parents by marrying, they have always been the best of friends. But as Desford pursues Cherry's grandfather and father around the seedier fringes of society, Hetta is forced to wonder if he might not, at last, have fallen in love. Set in the Regency period, this is a classic tale of misunderstood love and an arranged marriage. Captain John Staple’s exploits in the Peninsula had earned him the sobriquet Crazy Jack amongst his fellows in the Dragoon Guards. Now home from Waterloo, life in peacetime is rather dull for the adventure-loving Captain. But when he finds himself lost at an unmanned toll-house in the Pennines, his soldiering days suddenly pale away beside an adventure - and romance - of a lifetime. When Lord Cardross married 18 year old Lady Helen he also undertook the task of staving off financial disaster for her father, and settled the more pressing gambling debts of her brother. Has Lady Helen only married him for his money? The honourable Christopher Fancot, on leave from the Diplomatic Service in the summer of 1817, is startled to find his entrancing but incorrigibly extravagant mother on the brink of financial and social ruin - and more than alarmed that his identical twin, Evelyn, Earl of Denville, has disappeared without trace. Christopher, or Kit, the respectable brother, is forced into an outrageous masquerade by his wayward family's tangled affairs. But in the face of Evelyn's continued absence, even Kit's ingenuity is stretched to the limit. The accomplished Corinthian Sir Richard Wyndham is wealthy, sophisticated, handsome ,and supremely bored. Tired of his aristocratic family constantly pressuring him to get married, he determines to run away after meeting the delightful, unconventional heroine Penelope Creed. Penelope - literally - falls into his life late one night as she hangs from the window of her aunt's house - she too attempting to escape the pressures of forced marriage. Finding so young and pretty a girl as Amanda wandering unattended, Sir Gareth Ludlow knows it is his duty as a man of honour to restore her to her family. Society believes the worst of Justin Alastair, the notorious Duke of Avon who is clearly proud of his Sobriquet, Satanas. It is he who buys Leon body and soul from a scoundrel in a Paris backstreet. This story of mistaken love is a romantic fiction set in the English Regency period. It centers on Lord Sheringham who has been rejected by the woman he loves but the woman who has secretly loved him since childhood is waiting. The shy young Duke of Sale has never known his parents. Instead, his Grace Adolphus Gillespie Vernon Ware or Gilly for short has endured 24 years of rigorous mollycoddling from his uncle and his valet. But his natural diffidence conceals a rebellious spirit. So when Gilly hears of Belinda, the beautiful foundling who appears to be blackmailing his cousin, he absconds with glee. Only he has no sooner entered his new and dangerous world than he is plunged into a frenzy of intrigue, kidnap and adventure. Miles from anywhere, Darracott Place is presided over by irascible Lord Darracott. The recent drowning of his eldest son has done nothing to improve his temper. For now he must send for the unknown offspring of the uncle whom the family are never permitted to mention. Yet none of that beleaguered family are prepared for the arrival of the weaver’s brat and heir apparent. Horatia Winwood is the youngest and the least attractive of the three Winwood sisters. She also has a stammer. But when the enigmatic and eminently eligible Earl of Rule offers for her oldest sister’s hand – a match that makes financial and social sense, but would break her heart – it is Horatia who takes matters into her own impetuous hands. Can she save her family’s fortune? Or is she courting disaster? 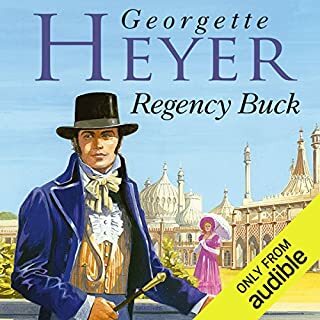 Witty, charming, elegant, and always delightful, Georgette Heyer – the undisputed queen of Regency Romance – brings the whole period to life with deft precision and glorious characters. An interesting, and slightly subdued version of Georgette Heyer's novel, superbly interpreted by an excellent British actor. This version is easier to believe than the full text, and a charming listen. Mr Armitage's capacity to give voice to young ladies is a joy, whilst continuing to use his natural timbre for clearly tall, robust, male characters, and managing camp males too. 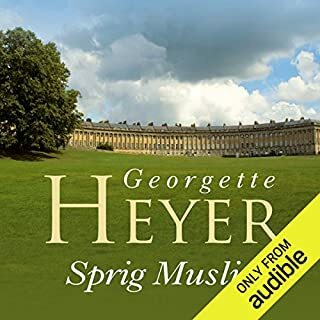 The other two of Miss Heyer's novels read Mr Armitage have fewer characters, and less Regency Romp: this really is read as if my a series of players. Enjoy. Highwaymen, duels and excitement all come together in this novel. And Richard Armitage adds gripping narration to the plot. Well worth a listen...and 4 stars! This is a lovely, romantic, period story. I don't know the full version, so I can't say how this abridged version compares, but it didn't feel like something was missing. The performance by Richard Armitage is absolutely delightful. So far I have listened to a number of audiobooks, and my favourite reader up til now was Stephen Fry. Armitage may now be my favourite. He reads calmly and clearly with his deep voice. He voices the female characters really lovely, especially Horatia and her little stutter. It was difficult not to listen to all 5 hours in one go. I really enjoyed this book. The lead characters are unpredictable and hold your interest. Beautifully read by Richard armitage. 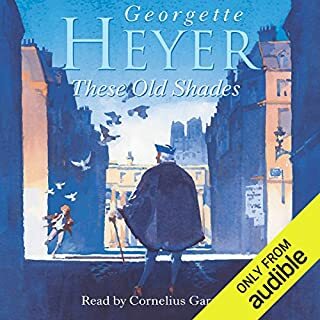 Has only suddenly dawned on me that this is an abridged version - looking back on some of my other Heyer audible favourites they've been abridged too. So I wonder if some clever cutting does actually make the experience better. (I have to say an unabridged I am currently listening to is going on a bit...). 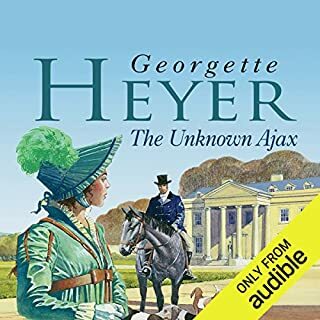 This is a lovely story with good strong (and somewhat unlikely) characters - wonderfully read by Richard Armitage who is definitely my favourite Heyer reader. 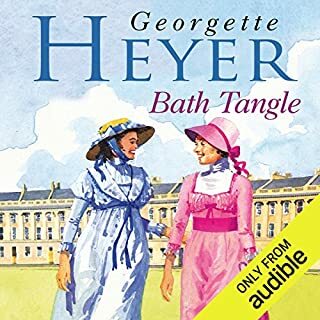 I'd read other Georgette Heyer books before, but not this one, so I came to this book not knowing what was going to happen! 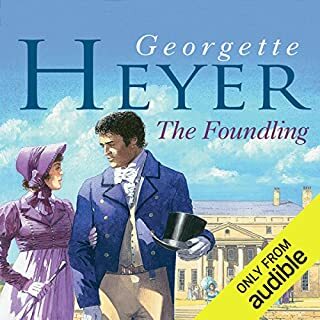 It was easy to follow (where I sometimes find that I lose track a little with audio books), with Heyer's usual delightful selection of characters, heroes, cads and heroines (and we're not necessarily talking traditional heroines). Richard Armitage does a terrific voice of reading this, I admit that I am a fan of his, but I was also unsure of him reading a book with so many female characters, but he did an excellent job, each character had their own voice and tone, so you always knew who you were listening to. 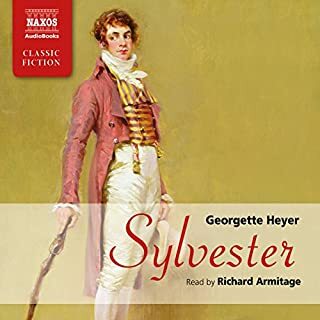 A delight to listen to, and I've now bought the other Heyer's books read by Armitage, a real achievement, as I rarely buy unabridged editions. 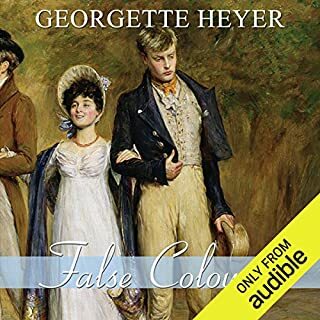 Definitely my favorite of Georgette Heyer's books! Richard Armitage performed this wonderfully and the story was lovely. I left Heyer stories behind years ago but was attracted by the reviews around Armitage. so a very light weight tale but brought alive by a great reader. The characters each had a distinct voice and so many tones and accents underpinned by beautiful and engaging intonation. An enjoyable listen. I really enjoyed this. It has a clever plot and lots of action. Horatia is a great heroine. Richard Armitage's performance really brings it to life, each character has their own voice and he moves between them seamlessly. 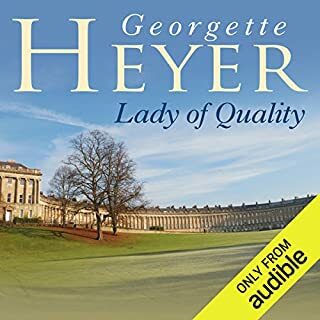 I have all the Georgette Heyer regency stories in book form and have read them several times over the years, but Richard Armitage makes them so much more enjoyable, all the different voices he gives the characters are amazing. I read this book a long time ago and loved it. This is a lovely story that's old fashioned with wonderful characters. My only complaint....... I wish this was the unabridged version of this story. This abridged version was missing some of the details and sweetness. Richard Armitage read wonderfully. Each character has unique voice and his inflections are superb. Definitely, one of the best! 😘"
Across the boards it seems that everyone is in agreement that these Georgette Heyer novels should be unabridged. I certainly add my vote to that. 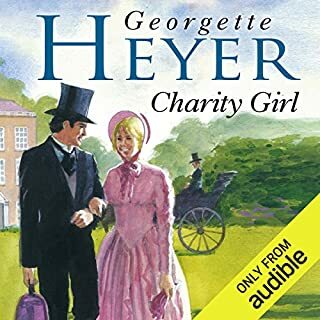 While this isn't necessarily my favorite Georgette Heyer offering, it is entertaining nonetheless. This particular story contains more wacky hijinks than her other works. Once again, Richard Armitage provides stellar narration. He provides three dimensional characters using only his voice. I'm pretty sure he could make my grocery list come to life, were he to read it aloud. All in all I found this to be a very pleasant listen. What did you love best about The Convenient Marriage? I love the mistakes the heroine makes along the way, and the lengths her resourceful yet annoyed brother will go to to keep her out of trouble. Meanwhile the hero, unbeknownst to all, has everything under control. It is very, very hard to pick a favorite character. The three I mentioned above are probably all tied for first place. They are all too human. I love Horry's honesty, Pel's devotion, and Lord Rule's fall from power--a confirmed (sort of) bachelor falling for the innocence and charm of a stammering seventeen-year old. What does Richard Armitage bring to the story that you wouldn’t experience if you just read the book? I wish Richard Armitage would read ALL Georgette Heyer's books. He infuses each character with emotion, believability, and personality. It amazes me that he is able to keep each character separate--each having their own voice and mannerisms--yet read the story so smoothly with no apparent break. He just flows from one character into another. In my opinion no one could do the reading better. My husband thought something was wrong with me because I would walk around our house laughing out loud. Then he would spot my headphones. The only comment I have to offer is that I wish the book had not been abridged. Some of my favorite parts were not included and I dearly missed them. But I appease myself with the knowledge that movie scripts are always somewhat different from the books they're based on. However even in its shortened form the story was 'complete,' and if I hadn't read the book first, I really wouldn't have been able to tell that something was missing. 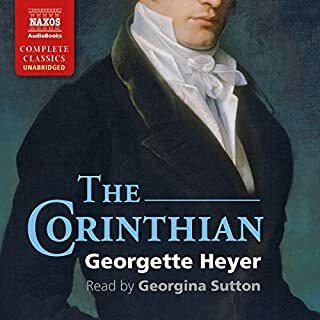 This was my first Georgette Heyer, to which I was irresistibly drawn by the fact that it's an audiobook read by Richard (Thornton Guisborne Thorin) Armitage. 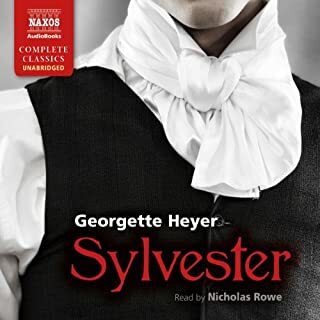 Also: Georgette Heyer. All I've ever heard about her is how wonderful her books are, the epitome of their genre, not to be missed. It's a cute idea. Horatia ("Horry") (note to parents everywhere: don't name your child Horatia, or that's what will happen) Winwood sees her older sister Elizabeth being drawn inexorably into a terrible situation: she loves someone else, but the Earl of Rule has asked for her hand. Given the family's financial situation – including a brother who enjoys the drink and the gambling – there is no choice: Elizabeth must marry the rich lord and not her penniless soldier boy. So Horatia – though very young by current standards – takes matters into her own hands. She tromps off to present herself to Rule and – calmly, coolly, and collectedly – offer herself as a substitute. Purely a business arrangement, you understand, and neither of them expected to interfere with the other; he can even keep seeing his mistress. (!) When her mother and sisters find out they all nearly conniption from the horror and embarrassment, but when it turns out that Rule rather liked the audacity of it all things look much brighter. The problem is that the concentration of the story drifts from there into other waters. If it had held its focus on Horry being unconventionally audacious and ahead of her time, convinced that whatever she was starting to feel for him the marriage was one of convenience purely, and so on, I might have had fun. But her unconventionality transmutes into a penchant for gambling and the high life just like her brother's, and it was a little nauseating. She was presented as being a smart girl, and yet she immediately forgets what it was like not to have very much and begins spending money like one to the manner born. Then the whole thing deteriorates into a rather unpleasant farce involving an extremely unwise flirtation with another man leading to results so nearly tragic I was a little stunned; I had expected something light and clever, not this adventure, involving at least two episodes of faux-highway-robbery, near-ravishment, a missing brooch, disuises, and Horry's brother and his Wodehouse-esque goofy sidekick. Armitage did a fine job of reading it – as well, that is, as any man could be expected to do with a book featuring a passel of women in the primary roles, one of whom has – wait for it – a stutter. 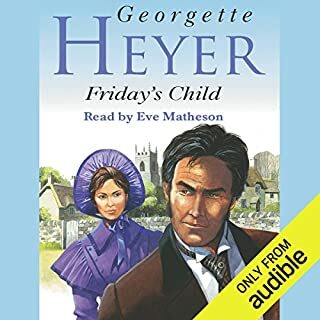 I have to ask – whoever chose this among all of Heyer's novels – what were they smoking? An audiobook of a novel whose main character stutters? It was painful to listen to – I can only imagine it was painful to narrate. I hope they paid Armitage well. 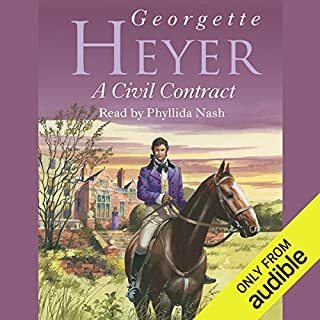 I understand that this is one of Georgette Heyer's early books, and not among the best; also, I just belatedly noticed that the audiobook was (horrors!) abridged. So this won't put me off the author's body of work. Would you listen to The Convenient Marriage again? Why? Big fan of English period romances. Listened to it twice but I could listen to Richard Armitage read the phone book. What was one of the most memorable moments of The Convenient Marriage? His accent is most enjoyable and I don't even mind when he changes his voice to match the character. Listened to another person read a book & I wanted to kill the narrator for the voices she affected. 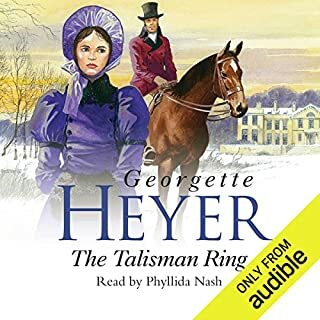 Just as in reading any of the Georgette Heyer books I found it impossible to stop listening to this recording once started so I sat into the early hours of the morning drinking it all in. I was far more delighted with The Convenient Marriage than Sylvester or Venetia (also narrated by Richard Armitage). 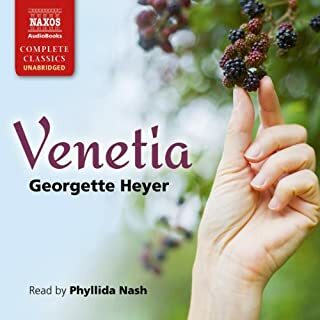 It helped that it had been much longer since I read The Convenient Marriage and so I could not actually remember the bits that were left out in this abridged version (I found the parts omitted in Sylvester and Venetia - especially in the meeting between Venetia and Damarel - almost painful). Chiefly though Richard Armitage does such an excellent job of portraying the various characters (each with his or her unique voice) and of expressing their emotions that he really brought them to life for me. He`s a good narrator too with clear pronounciation and has a very pleasant voice to listen to. 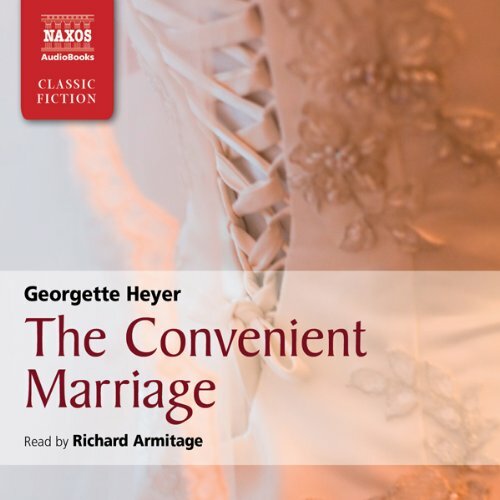 Would you consider the audio edition of The Convenient Marriage to be better than the print version? Yes- Richard Armitage is wonderful. The narrator seemed to make this story and its characters move through each scene- very well done! What about Richard Armitage’s performance did you like? His mastery of the charcters voices and his own velvety baritone were captivating. I felt I could listen to him read ANYTHING. yes... and then I listened to it again the next day. This was wonderful- I will be looking at more audio books after this. 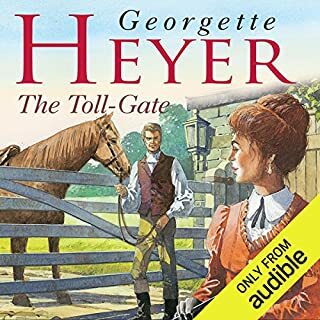 The book is abridged which is not clear on audible .com webiste and this means some of heyer's appealing dialogue is lost. . I have been living in a cave...but so glad I'm out of it now that I've discovered Georgette Heyer's Regency novels. After reading "Venetia" and "Sylvester: or the Wicked Uncle," I turned to "The Convenient Marriage" and was equally enchanted by her characters and the wild-and-woolly plot. In this story, The Earl of Rule, needing a good marriage, makes an offer to Lizzie, the eldest Winwood sister, but she is in love with someone else. Lizzie feels obligated to marry the duke to save her family's current destitute situation, so Lizzie's youngest sister Horatia steps up to rescue her forlorn sister. She makes Rule an offer: she will marry him in place of Lizzie to rescue the family's fortunes but will allow him to live his life as he always has (meaning, he may continue his affair with Lady Massey) and she will be left alone to live as she will. The deal is struck...and then all hell breaks loose as Horatia gets into one scrape after another, Rule realizes he is really in love with his wife, she feels like her antics have ruined everything and her gambling ne'er-do-well brother Pelham oddly enough tries to come to her rescue. It's a convoluted plot with lots of characters, masked bandits, sword fights, secret identities...but it's a delight -- funny, charming, enchanting and sweet. 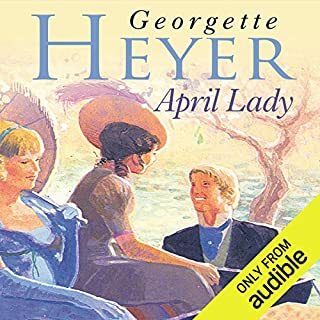 If you like Jane Austen's work, you will love Georgette Heyer's stories, which take place at a similar time but are infused with tons of humor and plenty of sweetness. A huge plus is the narration by Richard Armitage, who somehow manages to do all the voices and make them sound distinct. His narration is a major asset to this story. His voice is so spectacular, I would really, honestly, listen to him read the phone book. He transformed this story into something really engaging and fun. Which character – as performed by Richard Armitage – was your favorite? The Earl of Rule - I loved the timbre of his voice for this character. It made me sigh at times - especially at the end! It made my (brief) daily commute quite enjoyable. It is just amazing how Mr. Armitage can bring multiple characters to life. I was unfairly worried that Horry's stutter would annoy me - but it never did! More of Ms. Heyer's works read by Mr. Armitage, please!